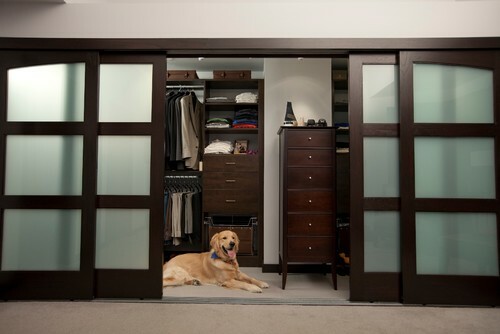 If you’re building or renovating your home, choosing the right built-in wardrobes is an important decision, as these will become a permanent feature of your decor. 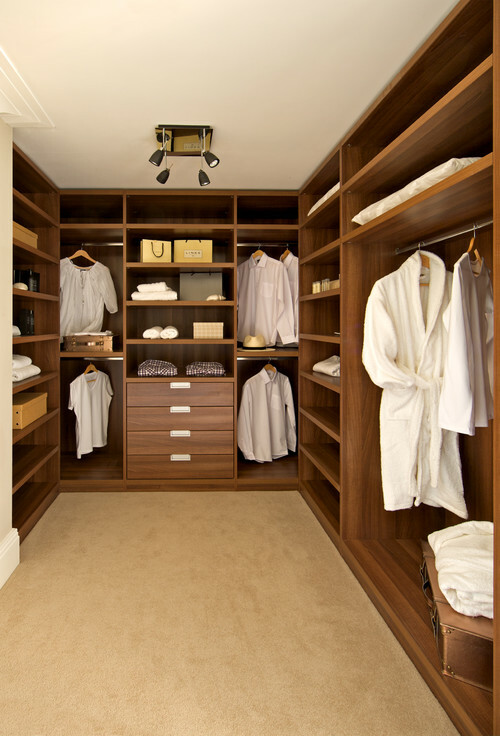 While your built-in wardrobes should enhance your rooms aesthetically, it’s also essential to use the available space efficiently. Elegant and contemporary, the Grayham Road London Fusion Cabinet offers a wide range of storage options for shoes, clothing and accessories. The rich, dark wood tones are a stylish contrast to the modern drop lantern light panel, seamlessly merging classic design with modern features. Simple, clean and modern, the Bellevue Hill Contemporary Cabinet provides different storage alternatives for shoes, clothing and accessories. With its warm wood tones, sleek lines and understated down lights, it would be ideal for homes or apartments with a lot of natural light. Bright, sleek and modern, the Bellevue Hill Contemporary Cabinet is ideal for space saving, as it’s predominantly comprised of drawer storage. With the subtle down lights and completely white finish, it’s clean, fresh and contemporary. Modern, spacious and rustic, the Chelsea Contemporary Cabinet has an extensive range of storage options for clothes, shoes and accessories. Open plan with soft wood tones and contemporary cabinet styling, these built-ins would suit a vast array of modern homes and apartments. Retro glam, the Coral Gables Contemporary Cabinet is open plan, with a vast amount of drawer and hanging space. Contrasting drawer tones with modern wood flooring create a modern edge with a touch of glamour. Stylish and elegant, the Cromer Contemporary Cabinet offers enviable drawer, shoe and hanging storage and is fresh and bright. The contrasting dark wood floor panelling with white cabinetry is very chic, while the functional addition of a fold away ironing table to the drawer configuration is an innovative feature. Modern fusion with oriental styling, the Compassvale Drive Contemporary Cabinet provides a unique storage solution combining drawer and hanging space with a full-length mirror feature. With soft wood tones and a striking glass panel front, this modern cabinetry also acts as a wall separating the bedroom from other living areas. Refined and elegant, the Millimetrica Contemporary Cabinet offers a vast amount of storage potential with different shelving, hanging and drawer configurations. Open, bright and airy, in soft grey tones it is clean, modern and perfect for an open plan home or apartment. Simple, fresh and clean, the Middle Harbour Contemporary Cabinet maximises storage space with a good blend of drawer, shoe and hanging cabinetry configurations. In light wood tones, it brightens up the room, while the simplicity of design would enable this cabinetry solution to blend seamlessly into any home or apartment interior. Modern, bright and natural, the Potrero Hill Contemporary Cabinet is a smart storage solution for a smaller room or apartment, with a good mix of hanging, drawer, and shoe space. Separated from the rest of the room by a richly toned and textured wooden sliding door, this modern and innovative cabinetry space elegantly combines neutral tones with rustic charm. Sleek, industrial and modern the Tiong Bahru Industrial Cabinet has extensive drawer and hanging space. The dark wooden cabinetry is strikingly contrasted with the buttery wooden flooring, white ceiling and subtle down lights. With framed glass panelling separating the built-in from the room, it becomes a stylish feature. 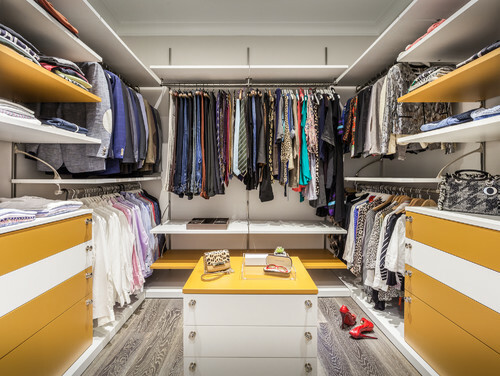 Elegant, modern and simple, the London Contemporary Cabinet provides an enviable amount of shelving and hanging space, for shoes, clothing and accessories. In subtle grey wood tones brightened by down lights and skylights, this contemporary cabinetry could be installed in a wide variety of modern homes and apartments. Bright, rustic and fresh, the Richmond Contemporary Cabinet offers a good balance of drawer, hanging and shelving storage. Framed by heavy wood panelling, the white contrasting cabinetry brightens the room, while the panelling provides an eye-catching feature. Luxe elegance, the Maplewoods Contemporary Cabinet is open, spacious and has extensive hanging and shelving space. The dark wood of the cabinetry is enhanced by the white ceiling and cleverly placed down lights. Uniquely configured as a natural extension to the open plan bathroom, it is the ultimate in luxury and seamless design. 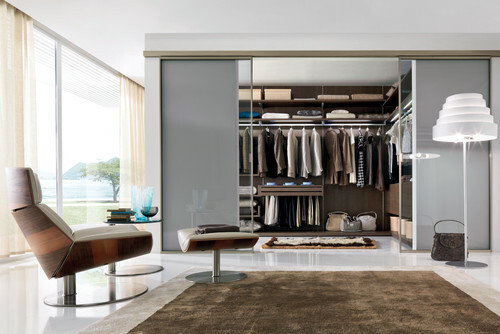 Fresh and contemporary, the Italian Modern Cabinet offers a good balance of hanging, drawer and shelving space, to efficiently store clothing, shoes and accessories. The glossy white walls combined with softly toned wooden panelling create a subtlety elegant fusion. Paired with glass panelling to separate the cabinetry from the room, it adds instant aesthetic appeal to the room. Rustic simplicity and contemporary charm are epitomised by the Chicago Modern Cabinet, which has both freestanding and built-in drawer, shelving and hanging storage. With heavy wood and glass panelled doors separating this unique cabinetry solution, it can be easily hidden, whereupon the doors become a striking room feature. 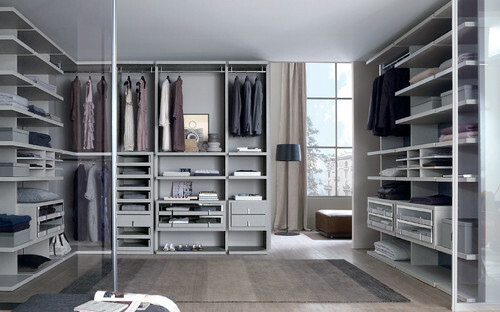 Fresh, sleek and modern, the Dusseldorf Contemporary Cabinet has a wide variety of shelving configurations for storing clothing, shoes and accessories. Open and spacious, it’s separated from the living areas by glossy metal-framed sliding glass doors. Contemporary and bright, it would be ideal for more modern houses and apartments, with a minimalist style decor. Whether you prefer a more industrial, elegant, rustic or contemporary-style cabinetry solution, you are sure to find the perfect alternative for your home in our Top 17. Looking to start on your next home renovation and interior design project? 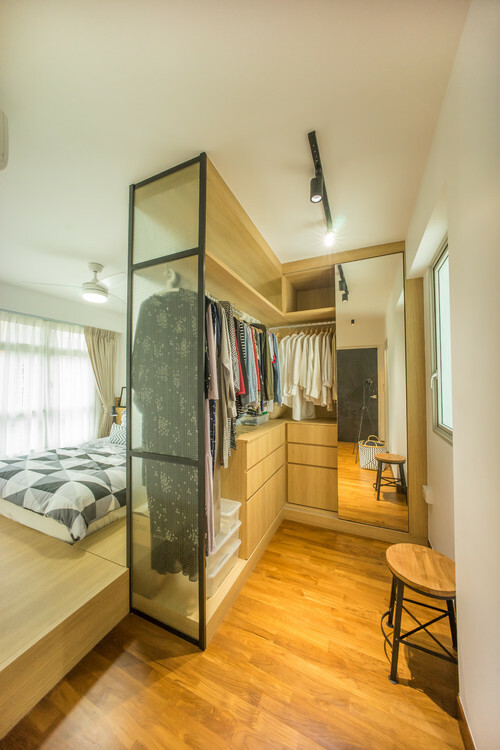 Contact us for carpentry services in Singapore at direct factory prices. Click here to get a Quick Quote now! Monday to Saturday 09.00 a.m. to 17.00 p.m.